Scientists often identify animals by looking at the tracks they've left on the ground in soft or muddy soil. Permanent copies of the tracks can be made by taking a cast of the track. You can try casting a track. You'll need a mix of plaster of Paris. 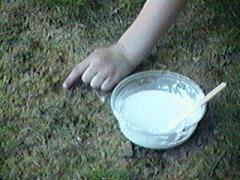 If you can find an animal track in your backyard or near your house try casting it. If not, cast your own foot by stepping in soft or slightly muddy soil so that you leave a distinct impression in the ground. If the ground is too hard you can soften it with some water. (Don't forget to clean your foot off before going in the house again.) If the soil is very wet, let it dry before casting the track. 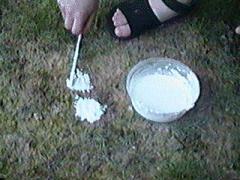 STEP 1: Mix a small bowl of plaster of Paris till it is smooth and just thin enough to be poured. STEP 2: Pour the plaster into the track filling it to the top and covering the area surrounding the track for about a half inch. Recycle a cleaned popsicle stick to smooth the plaster down. STEP 3: Clean your bowl up and wait for the plaster to harden. This may take several hours if the ground is wet. STEP 4: When the cast is hard, remove it from the ground. You should have a good copy of the shape of the subject's foot. Copyright Lee Krystek 1996. All Rights Reserved.